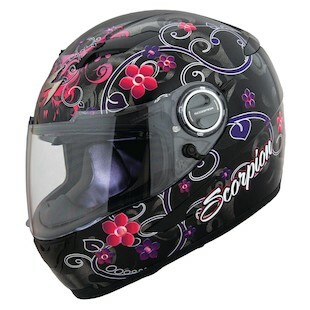 The new Scorpion helmet graphics for 2012 have been released, are available for pre-order and new to RevZilla.com. 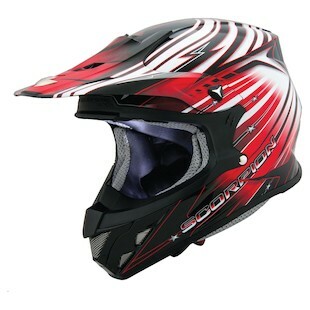 There is also an assortment of solid colored Scorpion VX-R70 helmets being released with the Fragment as well. 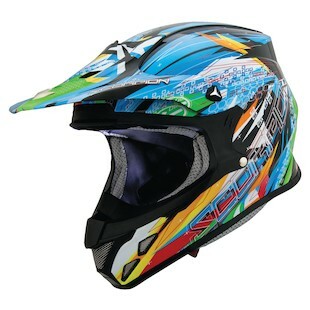 The Scorpion VX-R70 Fragment helmet is new in the lineup of off-road, brilliantly painted graphics, this one in multi-color black, blue and green. The shell is TCT, shatter resistant and aerodynamic with advanced dual-density EPS. The moisture wicking helmet liner and cheek pads are removable and washable. With an AirFit liner inflation system you can customize the interior to fit your head. 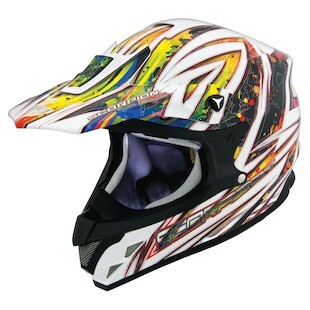 The Scorpion VX-R70 Flux helmet sports another new helmet graphic available in five colors with concentric stripes and stars. All these Scorpion helmets are loaded with technology and features that offer a ton of bang for your buck. A composite shell is shatter resistant and has aero-tuned ventilation. The closure is a titanium double-d ring for extra security. 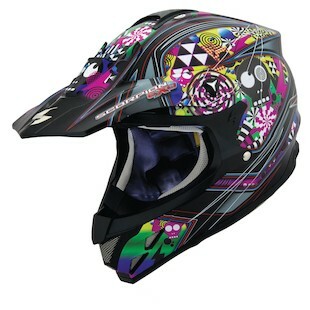 The Scorpion VX-34 Demented helmet is the newest graphic in the VX-34 offering. Like the other models, the rider is given aggressive styling at an affordable price, in a lightweight polycarbonate shell. The liner set and mudguard are removable and replaceable. The ventilation system is designed with large intake manifolds and four rear vents that allow maximum airflow. The graphic in black or white background has a pop art feel. Yet another great graphic is available in the Scorpion VX-34 Trix. The features of the "Trix," include all the same spec's as the other VX-34 models. With multiple colors: white, yellow, green, orange and red, it gives a intergalactic/tribal feel. The Scorpion EXO-500 Dalia 2 helmet joins a team of existing EXO-500's known for differentiating features. No sunglasses are necessary with the drop down inner sunscreen with both sides treated with anti-fog coating. The graphic is for women who want a feminine look without it being overly so, available in black or white with a vining floral pattern. We'll update as more information is available and expect a video when we have the lids in our hands. Check out some other resources if you are looking to compare Scorpion vs. ICON.